Discussion and decisions on complex systems require a thorough understanding of the system and of the processes involved. In order to provide a base for informed discussions and useful decisions, this workpackage has developed an infrastructure system simulator ("LiWatool"), which allows to model the entire water system (including water abstraction, water purification, drinking water supply, water consumption, wastewater discharge and treatment, reuse of waters, to name but a few) in one single simulator. This allows the evaluation of scenarios and of acting options, thus enabling a comparison between different options, thus supporting informed decisions. Therefore, modeling forms a core element of the LiWa procedure and of the LiWa project. "LiWatool" is a stand-alone simulator, which does not require costly third-party software. It uses Microsoft .NET Framework 4 (available for free from Microsoft’s webpage). Modelling is based on the concepts of resource flux modeling and material flow analysis (see, for example, Baccini and Bader, 2006), however these concepts have been extended in a manifold way. The macromodelling simulator set up within the LiWa project(working title "LiWatool”) represents the main elements of the water system (e.g. water purification plants, groundwater wells, water supply network, city districts, wastewater trunk sewers, wastewater treatment plants etc.) as building blocks (Schütze and Robleto, 2010). These are connected by resource links (e.g. water and wastewater, nutrient and pollutant fluxes). City districts are characterised by, among others, population number, distribution to social levels, water consumption patterns, percentage of non-revenue water. Besides water quantity, also water quality (in water supply and in wastewater) and energy fluxes are considered. As any analysis of variants also includes a cost-evaluation, costs can also be considered in terms of capital and operational expenditure, applying the cost categories used by the water operator. A variety of output options (e.g. time series charts, Sankey diagrams, numerical and textual output, interfaces to Excel) ensures that modeling results can feed into the discussion of scenarios and acting options by stakeholder representatives. The water system simulator has been set up in a flexible way, i.e. parameters, variables, elements and processes can be freely defined and modified by the user. A number of training workshops have been held to various audiences, thus ensuring that the water system simulator will be maintained locally even beyond the end of the project. Whilst the infrastructure system simulator has been set up for application to any urban infrastructure system, model implementations for the water system of Lima naturally form a core part of the modeling activities within the LiWa project. 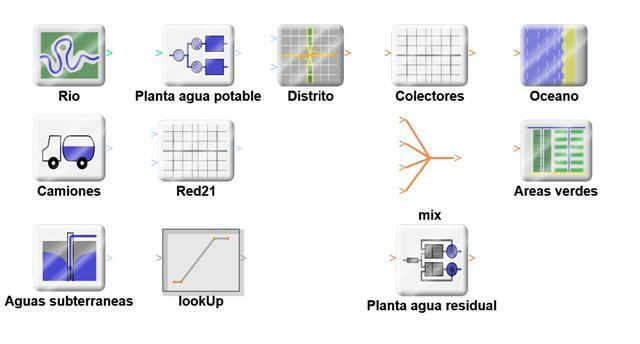 The water system of Lima and Callao has been represented in various levels of detail, thus serving different application needs (scenario evaluation, support of detailed planning of the water company). Figure 1 shows parts of the basic block library which has been set up for general water systems, whilst figure 2 provides a (simple) application example of the macromodelling procedure for scenario simulation. For the description of the system, building blocks (such as groundwater wells, water purification plants, city districts etc.) have been used. The figure illustrates results of a simulation by illustrating the main fluxes of drinking water (abstraction from ground water, river water purification, “production” of wastewaters. On a small level, the various departments of the water company SEDAPAL are involved in the modelling process, whilst on a wider level, a number of stakeholders (e.g. water company, government agencies, universities, NGOs) is involved in discussions of outcomes. 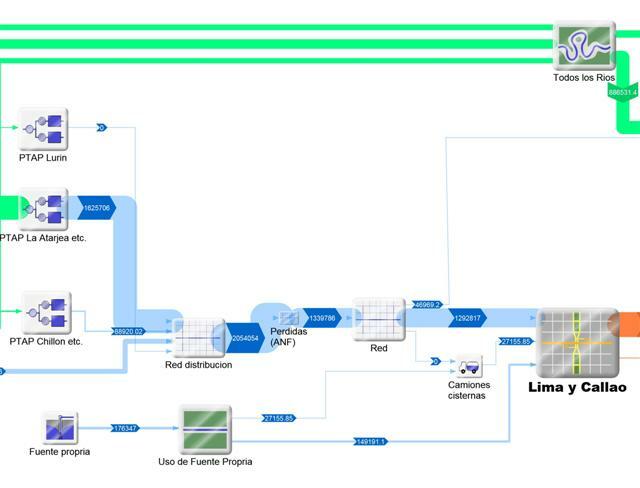 Thus the products are twofold: a water system simulator (which is also applicable to other cities and even to other infrastructure systems) and its instantiation and application for Lima, assisting in the overall process of stakeholder involvement and participatory decision finding. The model of the entire water system of Lima has successfully be applied for an in-depth analysis of the scenarios set up by Work Package 2. Model application, simulating the measures suggested during a Round Table event assisted in the discussion and evaluation of scenarios and action measrures at this event. Setup and application of the LiWatool simulator has integrated several of the workpackages of the LiWa project: Results of climate and catchment modeling for determination of water availability in the Lima region (cf. Work Package 3) has fed as input to the simulations. Evaluation of the scenarios (cf. Work Package 2) and of acting options for water and wastewater management in Lima in Round Tables (cf. Work Package 5) form core elements of the project, using the LiWatool simulator as a core base for informed discussions and decisions. As financial aspects (e.g. revenue by tariffs) are also considered in LiWatool, tariff concepts investigated in Work Package 7 are analysed for the real-life case of Lima. The analysis of green urban areas (Work Package 9) is supported by LiWatool. Several dedicated training courses on modeling have been held and will contribute to uptake of modeling also in the academic and professional sector in Peru (cf. Work Package 6). Contact: Manfred Schütze; Ifak Magdeburg e.V.